Tobias Harris leads all scoring with 22 points and grabs 11 rebounds as well to lead the Clippers to a win over the Wizards, 136-104. Washington wins an overtime thriller in Portland 125-124. Bradley Beal had 25 points, 8 rebounds, and 7 assists for the Wizards in the win, while Damian Lillard had 29 points, 8 rebounds, and 8 assists for the Blazers. Devin Robinson leads the way for Washington by scoring 23 points and grabbing six rebounds as the Wizards get the win over the Guangzhou Long-Lions, 140-111. TRANSACTIONS: Drafted by the San Antonio Spurs in the first round (28th pick) of the 2005 NBA Draft…Signed as a free agent by the Dallas Mavericks on July 13, 2010…Traded to the Indiana Pacers by the Mavericks for Darren Collison and Dahntay Jones on July 12, 2012..Signed by the Wizards as a free agent on July 7, 2016. PROFESSIONALLY: A nine-year NBA veteran with the Spurs (2007-10), Mavericks (2010-12) and Pacers (2012-16)…Owns career averages of 5.1 points and 4.3 rebounds per game in 438 appearances (92 starts)…Has shot 53.6 percent from the field…Has recorded three double-doubles in his career…Began his professional career at age 16 with STB LeHavre in France’s Pro A League,..Spent three seasons (2003-06) with the ball club before being drafted by the Spurs…Also played four games with the team in 2011 before the NBA labor dispute had been resolved…Averaged 12.3 points, 8.8 rebounds and 1.0 assist per game for LeHavre…In 2005-06, averaged 7.4 points, 5.1 rebounds and 1.0 steals per game in eight appearances in the U20 European Championships enroute to being named the ProA League’s under 20 Player of the Year. 2015-16: Started all 71 games in which he appeared during the regular for the Indiana Pacers…Set new career highs in nearly every statistical category, including points (9.2), rebounds (7.1), assists (1.5) and blocks (1.1)…Set a Pacers NBA franchise record among players who have made a minimum of 150 field goals in a season as he shot 58.9 percent from the field…Among qualified league leaders, ranked 34th in offensive rebounds per game (1.9), 43rd in total rebounds (7.1) and 36th in blocked shots (1.1)…Scored in double figures 35 times, pulled down 10 or more rebounds in 15 games and posted nine double-doubles...Tied his career high with 19 points while shooting 9-for-18 from the field to go with 11 rebounds in the road win at Oklahoma City (2/19)…Matched that output with 19 points to go with 11 rebounds while tying his career high of four assists in the win over the Rockets (3/27)...Scored 10 points and tied his career high with 14 rebounds at Charlotte (3/4)...Scored in double figures in four consecutive games, the longest streak in his NBA career, from Jan. 8-13…Scored his 2,000th career point at Miami (2/22)...Missed 11 games due to injury during the regular season: Missed six games (11/4; 1/30-2/5; 3/17) due to a sore lower back, one game (12/31) with a sore left knee, one game (1/17) with a sore left heel, two games (1/22-23) with a sprained left ankle and one game for rest (4/13). 2014-15: Appeared in 61 games and made six starts while averaging 4.3 points, 5.8 rebounds in 18.8 minutes per game with the Indiana Pacers…Shot 55.2 percent from the field and scored in double figures four times …Recorded a career-high 14 rebounds at Houston, 1/19…Grabbed 10 rebounds in back-to-back games on March 10-12, the first time in his career with consecutive games of 10 or more rebounds…Recorded the second double-double of his career with 12 points and 10 rebounds against Phoenix, 11/22…Tied a career-high with four blocked shots in the win over Milwaukee, 3/12…Recorded one DNP-CD (Jan. 9)…Missed 17 games from Dec.8-Jan. 7 with torn left plantar fascia…Sat out three games from Feb. 6-9 with a sprained right ankle. 2013-14: Appeared in 78 games during the regular season, finishing with averages of 3.5 points and 3.3 rebounds in 16.2 minutes per game with the Indiana Pacers…Blocked 72 shots during the regular season, finishing 35th in the NBA…Posted his third straight season with at least 100 offensive rebounds, collecting 107 on the offensive glass…Tallied a career-best four steals at Brooklyn (12/23)… Recorded his 1,000th career rebound in the second quarter at Washington, 3/28…At Milwaukee (4/9), made his first start since the 2012-13 regular season finale against Philadelphia (4/17/13)…Inactive vs. Boston (3/11) with a bruised left rib and recorded three DNP-CDs. 2012-13: In his first year with Indiana, made 80 appearances (two starts) while averaging 5.0 points and 3.9 rebounds in 16.5 minutes per game…Set career highs in games played (80)…Posted his best shooting performance of the season, going 6-for-6 vs. Portland (12/5)… One of two players to make appearances in each of the first 79 games for Indiana, he drew his first DNP-CD at New York, 4/14…Scored the 1,000th point of his career on 3/18 at Cleveland. 2011-12: Played in 61 games for the Dallas Mavericks, averaging 5.8 points, 4.7 rebounds and 18.7 minutes per game…Among Mavs with at least 200 attempts, his 54.6 percent from the field ranked second best on the team…Including six of Dallas’ first 18 games, he scored in double figures 10 times. 2010-11: After signing as a free agent with the Dallas Mavericks, averaged 3.1 points and 2.1 rebounds per game in 56 appearances…Shot 56 percent from the floor and hit 63-of-82 free throws (a career-best 76.8 percent)…Scored in double figures four times, pulled down 10 or more rebounds twice and recorded the first double-double of his career with 12 points and 10 rebounds in 21 minutes vs. Golden State (12/7/10)…Drew 25 DNP-CDs and sat out the game vs. Phoenix (4/10) with a stiff lower back. 2009-10: In 26 games for San Antonio, averaged 3.9 points, 2.0 rebounds and 6.3 minutes per game…Shot nearly 64 percent (.636) from the floor…Made his regular season debut vs. New Jersey (1/10) and scored a season-high 15 points on 6-for-6 shooting and 3-for-4 from the line with a season-high nine rebounds. 2008-09: Missed the entire NBA season due to a right ankle injury suffered during the summer and eventually required surgery at the end of January…Made one appearance for the Austin Toros of the NBADL, scoring four points with two assists. 2007-08: Made six appearances for the Spurs during his rookie season, totaling 21 points, five rebounds and four blocked shots…In a win over Milwaukee (11/11), scored 12 points on 4-for-7 shooting…Also had an assist, a rebound and two rejections against the Bucks…Began the season with the Spurs, seeing action in six of the team’s first 11 games…Later assigned to Austin of the NBA Developmental League (11/21) and was recalled (1/28)…Drew three straight DNP-CDs for the Spurs before being re-assigned on 2/1…Selected First Team All-NBAD…Averaged 16.8 points, 8.0 rebounds and 30.0 minutes per game in 46 appearances for the Toros…Shot 61.5 percent from the floor, ranking second in the NBADL in that department…Also ranked among the D-League’s top 10 in rebounding (8th) and blocked shots (9th)…Scored 10 or more points 38 times for the Toros, recording 16 double-doubles. 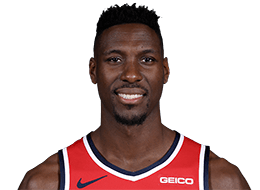 PLAYOFFS: He has also appeared in 56 career playoff games with the Spurs (2010), Mavericks (2011-12) and Pacers (2013-14; 2015-16), averaging 3.1 points and 2.7 rebounds per game while shooting .504 percent from the field…In 2014 appeared in all of Indiana’s 19 playoff games while recording averages of 1.9 points and 2.4 rebounds in 12.7 minutes per game…In 2013, appeared in 18 games for the Pacers in playoffs, totaling 29 points, 42 rebounds and 13 blocks in 8.3 minutes per game…In 2012, recorded playoff-best averages with 7.3 points and 4.5 rebounds per game while shooting 9-for-14 (64.3 percent) from the field and 11-for-13 from the free throw line (84.6 percent)…In 2011, appeared in six games and averaged 1.8 points in 5.5 minutes per game during the Dallas Maverick title run…After making just three appearances in the first three rounds, he played in three games in the NBA Finals, averaging 3.0 points and 1.7 rebounds in 9.0 minutes per game. PERSONALLY: Born and raised in Rouen, France…Name is pronounced “Yahn mah-HEEN-me,” however is comfortable with either the English (Ian) or French pronunciation of his name…Says his dad calls him Ian while his mom refers to him as Yan…Mother is from Jamaica and his father is from Benin, Africa…Has two brothers and two sisters…His older brother played professional soccer in Canada…Lists Remember the Titans as his favorite movie…Enjoys traveling, naming Cabo San Lucas being his favorite destination…A member of the French National Team from 2006 through 2011, he represented France in the 2010 World Championships in Turkey, averaging 4.5 points, 3.2 rebounds and 10.0 minutes per game in six appearances…In those six games, he shot 64.3 percent from the floor and 90.0 percent from the foul line…He helped lead France to a bronze medal in the 2004 European Junior Championships…Has an interest in fashion and has his own fashion line…He has a basketball camp in France during the summer.